The location of the Pannonian Basin. (modified from Horvath, 1985 and US Geological Survey). 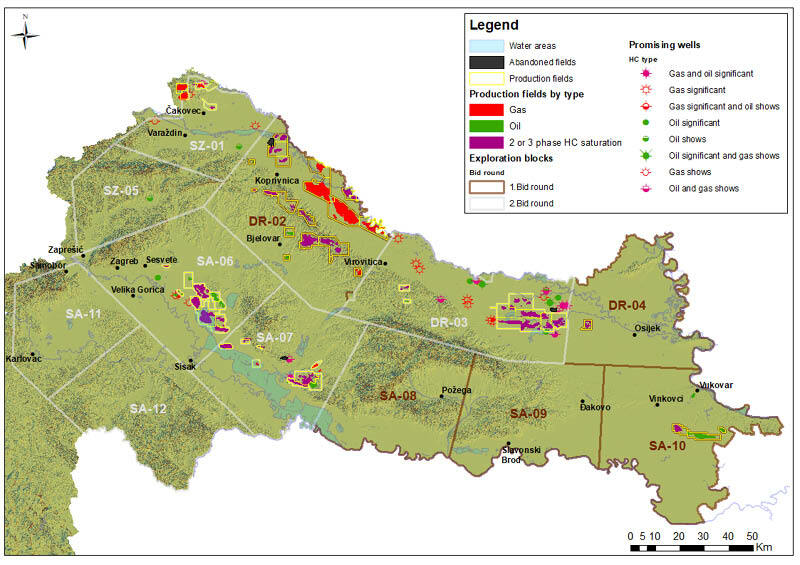 Production in the Croatian part of the Pannonian Basin started in the late 1940s and to date the area has produced more than 700 MMb of oil and more than 400 MMboe of natural gas. Parts of the basin, including the available acreage, remain underexploited with respect to new pools or missed pay opportunities. Preliminary analysis of the seismic and other available data confirm that the available acreage contains significant remaining potential. Where is the Pannonian Basin? Croatia is located at the crossroads of Central Europe, the Balkans and the Mediterranean. It enjoys a very varied topography, ranging from the high mountains of the Dinaric Alps, which rise to over 1,000m, to large river plains through which the Sava, Drava, Mura, Kupa and Danube Rivers meander. Map of depressions and sub-depressions in Croatian part of Pannonian Basin. Geologically the country is split into two main onshore provinces, namely the Pannonian Basin Province in the north-east and the Dinarides in the south-west of the country. These areas are very different both in geographical appearance and in geological terms. 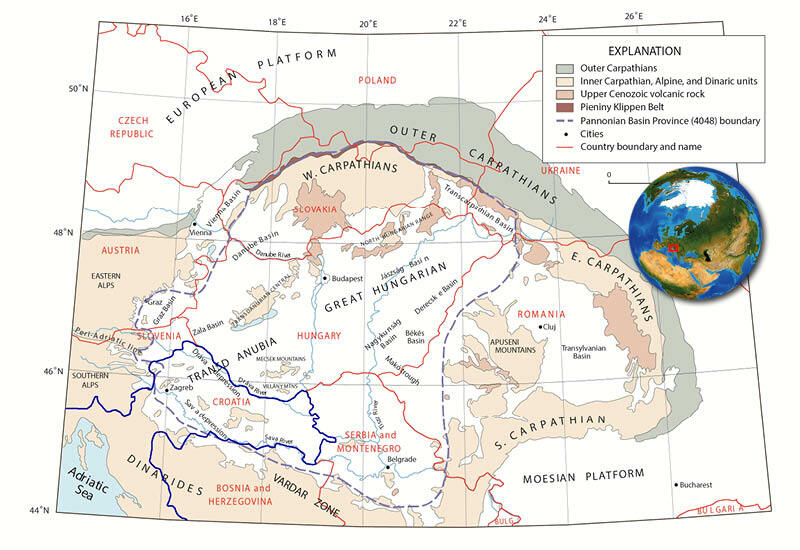 The Pannonian Basin is encircled by the arcuate Carpathian mountain chain, which joins the Alpine mountain system to the west and the Dinaric mountain system to the south-west. The basin is internally segmented by the intra-Carpathian mountain ranges and basement uplifts, but its continuity at Tertiary level is not disrupted. This is evidenced by the Graz Sub-basin and Vienna Basin in Austria, as well as the East Slovakian Sub-basin in Slovakia and Ukraine and the Transylvanian Basin in Romania, all of which show geological continuity with the central part of the Pannonian Basin. The Croatian part of the Pannonian Basin covers some 26,000km² and is split into four main sub-basins, namely the Sava, Drava, Mura/Hrvatsko Zagorje and Eastern Slavonian-Srijem Sub-basins. The present tectonic setting of the Pannonian Basin Province is characterised by Palaeozoic to Mesozoic sedimentary successions deposited upon older metamorphic basement. The basin is infilled by Tertiary and Quaternary sediments. The basement blocks were formed during the Paleogene by extrusion from the west along strike-slip faults and were mainly subjected to sub-aerial erosion during the Maastrichtian-Palaeocene. During the Cretaceous compressive deformations were common in the basin, caused by the closure of the Tethys Ocean. Extensive strike-slip faulting began during the Middle Miocene, leading to pull-apart basins which rapidly evolved into rifts. Extension rates of up to 200% are often associated with reactivation of earlier compressional faults. The time of rifting varied according to the location; basins in the north and west are inferred to have seen the earliest rifting. Many of these Miocene extensional basins were initially starved of sediment but were subsequently filled by two major deltaic systems prograding from the west, north and south-east, draining the Carpathians. 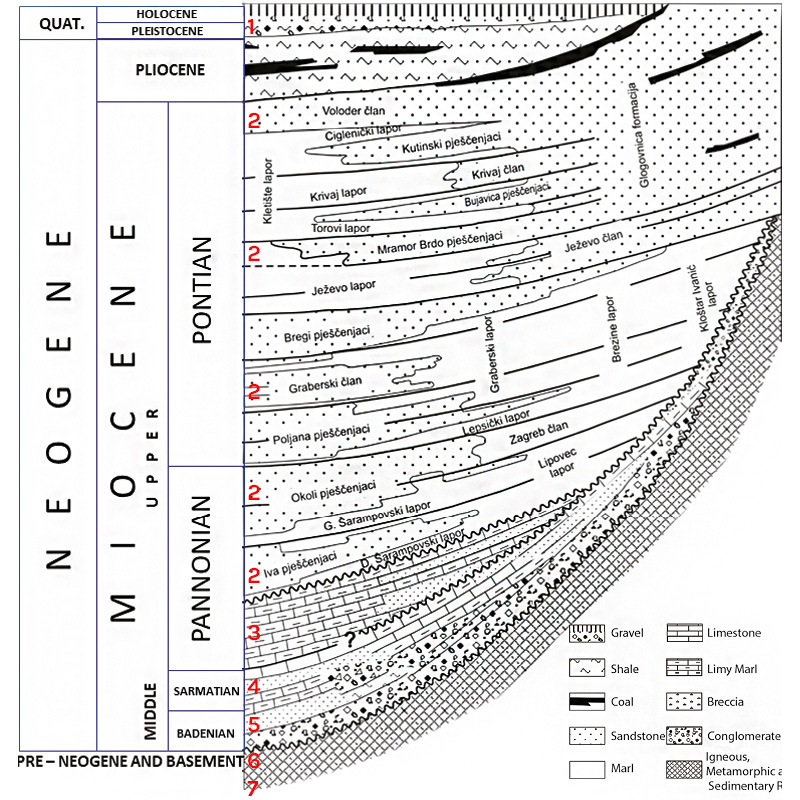 The combined thickness of the Palaeozoic to recent series exceeds well over 10,000m, with the Neogene succession reaching over 7,000m. Schematic lithostratigraphic section of Drava Depression (modified by Šimon, 1980). Seven main lithostratigraphic units have been identified in the Pannonian Basin, as shown in the schematic lithostratigraphic section. The oldest unit is pre-Permian and represents the basement. It consists predominantly of magmatic rocks including granites, gneisses, schists and other low-grade metamorphic rocks with occasional sedimentary layers. These rocks appear to have been affected by both the Caledonian and Hercynian orogenies. Inside the shallow depressions along the basin margins and in the central area, an angular unconformity separates the underlying basement from the overlying sedimentary and carbonate rocks, the deposition of which was related to platforms and troughs which formed during the late Permian, Triassic and Jurassic periods. Unit 6, which underlies the base Tertiary, consists of these shallow water carbonates, dolomitic limestones and breccias up until the mid-Triassic when associated volcanism indicates the fragmentation of west Tethys. Younger sedimentary basement rocks largely comprise carbonate sediments that were deposited in a gradually deepening platform basin which featured seamounts. The end of the phase is marked by the late Jurassic obduction of ophiolites, followed by local uplift and erosion. The collision of the Alps and the Rhodope Mountains began during the late Cretaceous-Palaeocene period, so the base of Unit 5 is therefore marked by the initial Dinarides thrusting and the development of longitudinal flysch and then molasse, with troughs oriented parallel to the movement of the overthrust system. 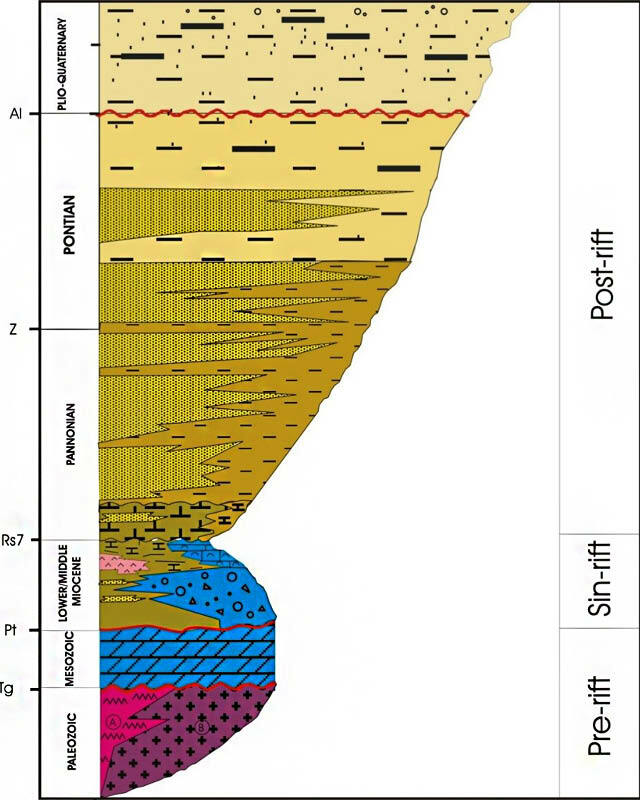 In deeper parts of the trough, especially in the Sava and Drava depressions, Upper and Lower Miocene sediments of Unit 5 discordantly overlie the basement rocks, while in other depressions they are in discordant contact with Mesozoic or Paleogene strata. The formation of these units is related to the Miocene wrench pull-apart extension, which occurred in response to rotation of the Apulian plate; it seems that wrench faults followed the weak zones formed during the previous thrusting process, creating the fault-bounded Sava and Drava Basins with Dinaric orientation. These strong movements induced rapid subsidence and fault-controlled marine and non-marine sedimentation that lasted up until the end of the Sarmatian. At the beginning of this episode large quantities of breccias, conglomerates and various sandstones were deposited in alluvial fans, braided rivers and near shore areas. Simultaneously, considerable discharge of lavas and pyroclastics occurred, related to fundamental wrench fault activity along the new faulted basin margins. At a later date some of these carbonates were reworked as thick breccias. Initial fault-related subsidence began to slow by Carpathian times and in marginal marine areas limestones formed in back-reef, reef and fore-reef settings. Periods of gentle subsidence at the beginning of the Badenian prompted migration of the reefs towards marginal parts of the basin and the formation of thick packages of organic rich marl in the central areas. At the end of this phase during the Sarmatian slow thermal uplift and extensive weathering of the marginal parts of the depression led to the formation of a regional unconformity. Subsidence occurred immediately after the uplift due to the cooling of the lithosphere, resulting in relatively rapid filling of the newly formed basin with sediments with lake characteristics. Regressive tendencies predominated in the period from the end of the middle Miocene to the present, facilitating the progression of deltaic and turbiditic depositional systems and the infilling of depressions. This cycle began with the deposition of Lower Pannonian organic-rich dark anoxic marls in the deeper parts of the basin, while light grey marls were simultaneously deposited in the marginal areas. These sediments were followed by Upper Pannonian and Lower Pontian sandstones of turbiditic origin which were only deposited in the deepest parts of the depression. Alternating layers of Lower Pontian argillaceous limestones and siltstones of delta slope and sandstones of delta front followed. Oil generation started in the Upper Plio-Quaternary sands and clays of the alluvial plain that feature frequent coal intercalations. Unit 1 overlies the aforementioned succession and represents modern sediments. 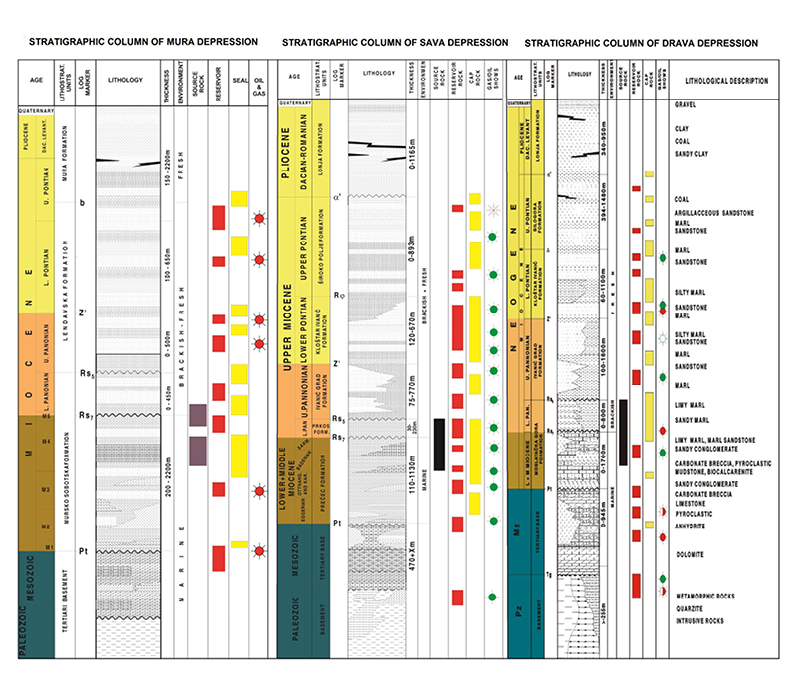 Generalised geological column of Mura, Drava and Sava depression (modified from Barić et al., International Oil and Gas Conference Zadar, Croatia, 2001). Potential Upper Triassic black shales and marls could be considered as sources of oil and natural gas in deep systems. Miocene-age, near-basement basal clastic bodies (conglomerate). The series represent an excellent reservoir (porosity values may reach up to 61%) – proved. The most important seals in the entire basin are provided by intra-formational pro-delta and delta-top mudstones. In the majority of the fields, the argillaceous interval above the reservoir usually forms the sealing horizon, and may also be the source rock for the next reservoir. The Neogene series is considered as top seal to all older reservoirs of the Pannonian. There are five main groups of plays identified in the Pannonian Basin. 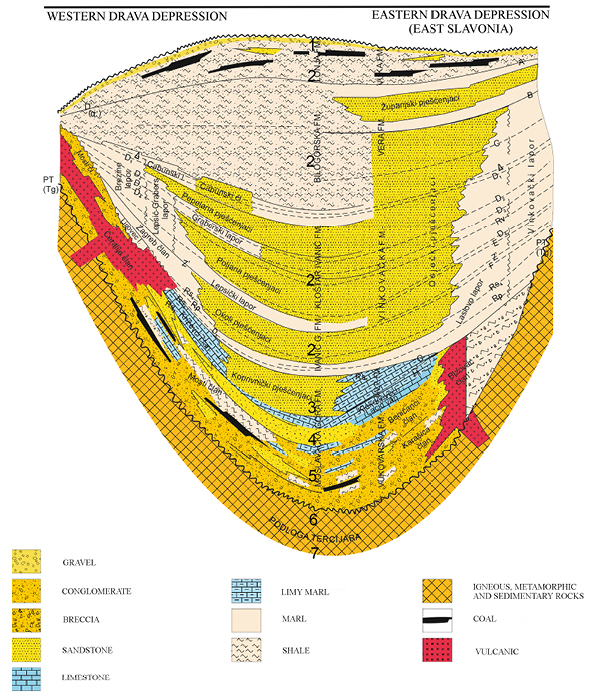 These are best classified according to their structural affiliation, as the majority of fields involve reservoirs at many stratigraphic levels. Miocene-Pliocene clastic and/or carbonate series draped over basement highs form the most significant play types in the basin, represented by post-rift compactional drape plays. Fractured and/or weathered basement (highs), with or without Miocene basal conglomerate and sealed by Miocene mudstones, form a very important group of plays. These first two play types are sometimes found together. Miocene extension-related, tilted fault blocks containing reservoirs of various ages form an important group of plays (Pre-rift/Basement compactional drape). Inversion-related play types are found in the anticlines associated with reactivation of strike-slip faults and include Miocene-Pliocene clastic reservoirs. Syn-rift-related, Miocene sandstone series truncated and sealed by post-rift mudstones can be considered an independent play type or may formally belong to type 1 plays. In general, combined structural-stratigraphic plays are the most typical in the majority of the fields in the basin. The plays described above are valid in all countries sharing the area of the Pannonian Basin. Map of significant hydrocarbon shows. CHA Croatia’s 2nd Onshore Licence Round represents a great opportunity for exploration investment with relatively low exploration risk provided by the prolific Pannonian Basin and its well-known potential. Croatia also offers excellent fiscal terms, with 90% of investors’ shares in a profit-sharing pool. In addition, there is proven by-passed potential of 37 exploration wells drilled in the area offered in the 2nd Onshore Licence Round. Recommended GEO ExPro articles relating to, or similar in content to, oil and gas exploration in Croatia. Integration of seismic, well and potential field data has led to a better understanding of the petroleum system of the Adriatic Basin. The final part of this 2-part article reviews the validity of the potential plays in the area in terms of the Golden Zone concept. Dr. Munim M. Al-Rawi, a highly-respected and pioneering Iraqi-Irish geologist, and popular contributor to GEO ExPro Magazine, died suddenly but peacefully on 1 November 2018 at his home in Ireland.